Advancin™ is an advanced formulation of 8 ingredients, including Vitamin C, Hesperidin, Chamomile Extract, Luteolin, Bromelain, Quercetin, Resveratrol, and Green Tea. Dr. Russell Blaylock developed Advancin to help optimize the many inflammatory processes taking place within the body. To this end, we are proud to announce that Dr. Blaylock has developed Advancin™, a brand-new exclusive formula that contains not one or two, but NINE separate inflammation-busting ingredients. And all target and reduce excess body-wide inflammatory activity. A new natural breakthrough containing 9 hand-picked ingredients . . . 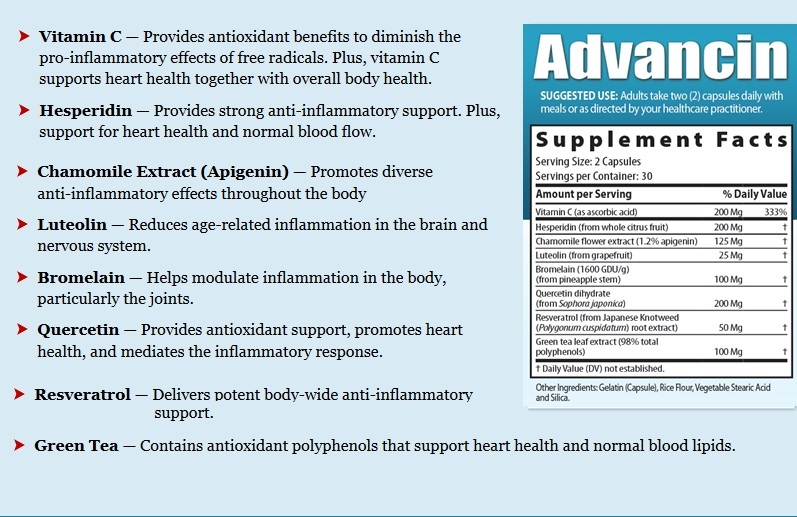 The ingredients in Advancin™ were carefully chosen by Dr. Blaylock to fight inflammation, provide antioxidant support, and promote the health of your most important body systems. If you're convinced that the “smoldering fires” of inflammation shouldn’t be left unattended, then you’re ready to take the first step to supporting your body’s proper inflammatory response. Advancin™ provides powerful ingredients to help your body fight back against the many factors contributing to excess inflammation. With Advancin™ you get a proprietary blend of nine antioxidants and potent nutrients in just one doctor-developed formula to help you combat the fires of inflammation.
" Advancin has helped me immensely. I have experienced less joint pain and been able to move easier! Thank you!" "I began taking (Advancin) hoping it would help my hip. Went to the dentist for my 3 month treatment of periodontal disease and surprise....my checkup showed marked improvement!" "I have found a noticeable improvement in back pain that my prescription medication did not help with. In several weeks of use, Advancin has made a definite difference." "Overall Advancin seems to have had some benefit to my overall health."